This is a live blog from the College Station City Council’s workshop and regular meetings on Thursday, May 23. It’s not the official minutes. The council heard a presentation on the FY 14 budget calendar and review process. The proposed budget workshop dates are August 19-21. The regular meeting has started. After the Pledge of Allegiance, Mayor Pro Tem Karl Mooney led the invocation. 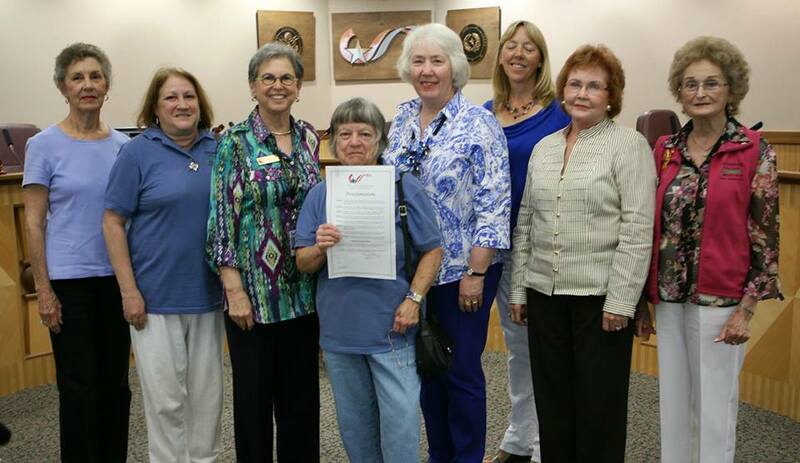 Mayor Berry presented the A&M Garden Club a proclamation for being named Texas Garden Club of the Year for 2012. Pictured below are (l-r) club members Geneva Eubanks, Michele Wehrheim, (Berry), Club President Kay Hamn, Jane Cohen, Sarah Barrick, Kelly Klimple and Mary Staffel. Gary Ives of the Springbrook Homeowners Association spoke during Hear Visitors, when citizens may address the council on any item that doesn’t appear on the posted agenda. Ives expressed the neighborhood’s desires for the Lick Creek Greenways Trail. The second reading of a non-exclusive franchise agreement with MedStar Services for collecting and disposing of medical waste from various healthcare-related facilities. Awarded annual purchasing agreements for dewatering chemical to Fort Bend Services (not to exceed $130,800) and Atlantic Coast Polymers (not to exceed $7,400). Voted 6-1 to renew the building use agreement with the Arts Council of Brazos Valley. Councilmember Jess Fields voted against the motion. Voted 6-1 to adopt a new rate review mechanism tariff with Atmos Energy. Councilmember Fields voted against the motion. After a public hearing, the council unanimously approved the rezoning of about 3.7 acres at the intersection of Barron Road and Victoria Avenue from Agricultural Open to Suburban Commercial. The rezoning will allow for development that will generate lower traffic counts and be more compatible with the adjacent residential area. After a public hearing, the council unanimously approved the establishment of additional commercial loading zones in the Northgate District. The ordinance establishes a new 24-hour loading zone on the north side of Patricia Street near its intersection with Boyett Street. Two additional areas on Boyett Street and First Street will be available for loading from 7-11 a.m. and from 2-5 p.m. each day. The meeting was adjourned. The council meets again June 13. This entry was posted on May 23, 2013 by City of College Station. It was filed under City Council, Public Communications and was tagged with A&M Garden Club, arts council, Council Meetings, National Public Works Month, Northgate, planning, public works, rezoning.